Alex: And I got a couple of pistols and a knife. We have enough explosives to last us almost a day. Most importantly, have fun, man. MPAA Rating: R for disturbing violent content, language, brief sexuality and drug use - all involving teens. Director Gus Van Sant's greatest commercial success was 1997's Good Will Hunting, which received multiple Academy Award nominations and won two Oscars. After the relative disappointment of its followups, Psycho and Finding Forrester, Van Sant abandoned the commercial Hollywood style that had brought him fame and fortune, and returned to his independent roots, with 2002's Gerry and last year's Elephant. Gerry is a curious film, done in a style that is almost the complete antithesis of Van Sant's biggest box-office hits, and indeed of typical Hollywood films. This tale of two friends who become increasingly lost in the desert is primarily an exploration of duration, of time and its passage. Van Sant uses extremely long takes and static camera to force his audience to experience time as his protagonists experience it, and to continually remind us that time is the enemy of the two friends, as their seemingly inevitable fate draws ever closer. 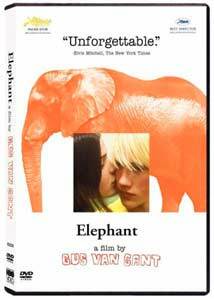 With Elephant, Van Sant continues in this experimental mode. The film is often described as an examination of the causes and events leading up to the Columbine massacre (and there are some throwaway references to Nazism, bullying, and video game violence), but Van Sant is clearly more interested in exploring subjectivity, understanding and depicting the mental states of his young characters as they go about their typically teenage day-to-day lives. Film has never been very good at expressing a first-person, subjective world. In writing, all an author has to do is to begin a sentence with the word "I," and the reader is instantly transported inside a character's consciousness. Film can resort to clichéd devices such as a ripple effect or temporary lack of focus to indicate a dream or interior mental state, but it's most often through point of view that a director gives us a glimpse of how a character experiences the world. By showing us what a character sees, by replacing his or her eyes with the lens of a camera, we're in effect seeing things through that person's eyes, viewing the world as that character would. But the effect is only partial, and can't really be sustained (the one attempt at a film seen entirely from one person's point of view, 1947's Lady in the Lake, resorted to mirrors to allow us to see the face of the protagonist). Van Sant tries a different tack here, and his methods are quite successful. As his characters move down the long corridors of their high school, the camera follows them, sometimes from a few feet away, sometimes farther, but maintaining a consistent distance, from an unchanging angle. We're allowed to see the actor, and also everything he or see she sees, and we're drawn into the character's world. Often, Van Sant will film from behind, but as the character's internal state is interrupted, for example by a greeting from another student, he'll then switch to filming from in front, showing us the character's face, again from a consistent distance. We then see what's behind, as if the character is half-remembering the recent interruption of his consciousness. These long tracking shots are a continuation of Van Sant's experiments with duration from Gerry, but this time he's using duration in the service of subjectivity, rather than simply calling attention to the passage of time. This subjectivity is further enhanced by the soundtrack. Frequently we hear the sound of voices and normal school day activities, but they're muffled and indistinct, as if the character is lost in thought. When there's something that requires attention (again, for example a greeting), the voices snap into clarity, as the character snaps into consciousness. Van Sant even uses a slight slow-motion to emphasize important moments, just as our minds can take in more information in a shorter span of time when we're particularly struck by an event or incident. Curiously, Van Sant uses these techniques exclusively with the personages who are peripheral to the action, especially Eli (Elias McConnell) and John (John Robinson), and to a lesser extent Michelle (Kristen Hicks) and Nathan (Nathan Tyson). When he's filming the killers, Eric (Eric Deulen) and Alex (Alex Frost), the camera generally pans slowly across their faces, or remains static. It's as if he's once again saying that he's not particularly interested in the motivation for the killing spree, and wants the killers to remain ciphers, unexplored and unexplained. There's not a whole lot of plot in Elephant, which spends most of its time depicting the typical daily activities of high school students on what would turn out to be a spectacularly atypical day, but Van Sant's screenplay certainly keeps things interesting with the limited materials at hand. We're not even 15 minutes into the movie when we recognize that we've already experienced a certain scene, although from a different point of view, and it's soon obvious that we're going to experience the same span of time from the perspectives of many of the characters, and only when those characters intersect will time again move forward. But the repetition isn't schematic, and is contrasted with the linearity of a plot whose outcome is already known. Within the basic plot structure, the actors mostly improvised their lines, and the result is effective, with naturalistic dialogue and performances, from a mostly amateur cast. The cinematography by Harris Savides (who also worked with Van Sant on his previous two films) is excellent, often using available light, and the soundtrack, which mixes musique concr�te and classical music, is varied and interesting. Elephant may strike some as being overly formal and "artsy" (and its Best Director and Best Picture awards at the 2003 Cannes Film Festival will do nothing but confirm their suspicions), but for those with the patience to follow its rather languid pacing, and to examine Van Sant's visual and aural strategies, will find one of the most intriguing, and indeed one of the best films of 2003. Image Transfer Review: Van Sant shot Elephant full frame, and both that version and a cropped 1.85 version are present on the disc. The transfer is somewhat problematic in both cases. Colors are vibrant, almost eye-popping in some cases, but the black levels are not quite what they should be, and the image is slightly soft and lacks detail. Edge enhancement is occasionally distracting. It's curious that HBO would choose to include the 1.85 version, since it simply lops off the top and bottom of the image, without adding any information at the sides. Audio Transfer Review: There are DTS and Dolby Digital 5.1 mixes, as well as a Dolby Surround mix, and in all of them, the sound is rich and full, with great clarity, and good bass. Curiously, with the 5.1 mixes, there is no activity whatsoever in the surround channels. The mono French and Spanish dubs are predictably less rich sounding, but are adequate. Extras Review: The 12m:05s On the Set of Elephant: Rolling Through Time is in widescreen, with vibrant colors but an extremely soft image. It consists of rehearsal and behind-the-scenes footage, interspersed with brief comments from the actors, and isn't very interesting or enlightening. The full-frame trailer's transfer is grainy, with excessive edge enhancement. A worthless HBO Films promo is also included. Gus Van Sant's Elephant is less an examination of the causes of the Columbine massacre and more a portrait of teenage life, done in a unique and convincing style. It's a pity that HBO didn't take more care with the transfer, or find some worthwhile extras, but the film itself is excellent, and recommended.